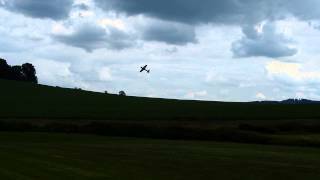 Pilot: Jan Spatny, model type: YAK 54, motor: Gigatex Slim 3500W (sensored), speed controller (ESC): TMM 14063-3 X-SERIES (MGM COMPRO), batteries: 5000mAh 12S. JET that regularly achieves the speed over 170 mph! Setup: Schuebeler HST-51, 12S 5000mAh SLS Li-Pol and TMM 14063-3 X-SERIES speed controller. The pilot is Ali Machinchy, one of the world top RC pilots.